First, it is important to know most DNA does nothing. DNA is classified as “coding” or “non-coding.” Coding DNA codes for the production of enzymes and proteins required to run the processes necessary for life. Non-coding DNA is similar to random letters placed together that do not make sense. The purpose of such an abundance of non-coding DNA is poorly understood, but of the 6.5 feet of DNA in each human cell, only about 1 inch is coding DNA. Mistakes within the non-coding sections have no apparent consequences and that is one theory as to why there is so much—it may act as a buffer to protect coding DNA. A previous Michigan State University Extensionarticle, “Mutants have value too,” mentioned some DNA changes are useful. This article will discuss how they occur and gives examples of commonly seen plant mutations. 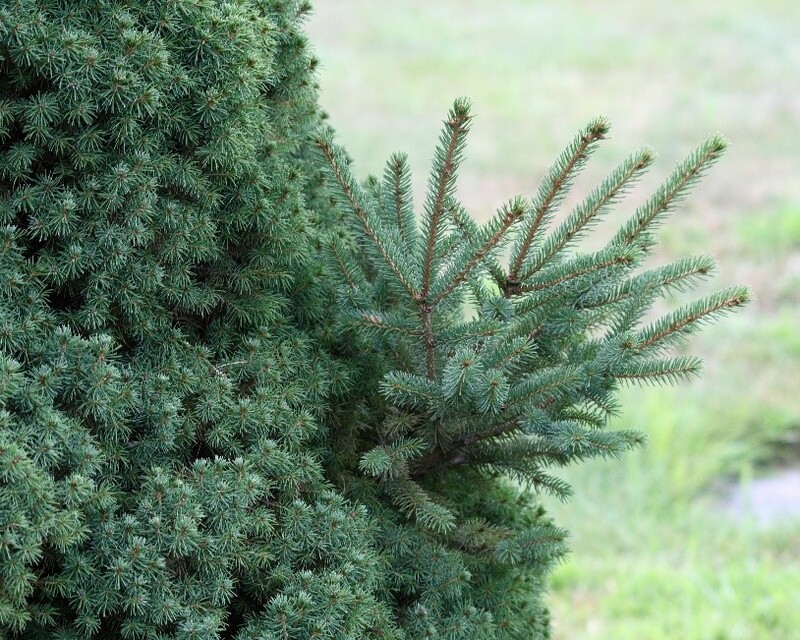 Dwarf spruce with a branch reverting to the original non-dwarf state. Photo by Ragesoss CC BY-SA 3.0.